Android: What Does The ‘Emergency Call’ Button Do? 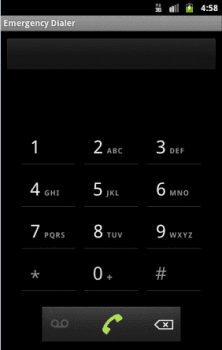 If you set a lock screen on your Android device, the PIN entry screen will then feature an Emergency call button toward the bottom of the screen. The button will enable anybody who grabs the phone to at least be able to dial 911 in the case of an emergency without needing to enter a PIN or lock pattern. This may concern some Android users because of the fear of accidentally dialing 911. This was a fear of mine. I thought I’d eventually end up accidentally hitting that button at three o’clock in the morning and wake up 30 minutes later find the police swarming my house. I decided to remove the lock screen just in case. But this is bad for the security of the device. On most Android devices, the “Emergency call” button only brings up the dial pad and doesn’t automatically dial 911 when you press it. You have to press “Emergency call“, then press 9-1-1 for it to do anything. However, on many older phones and in some older versions of the Android OS, this isn’t true. In some rare instances, some Android devices actually do dial 911 when you press the button, or at least populate the phone number with 911. My child keeps dialing 911. How do I prevent this from happening? Some phones like the Samsung Galaxy series has a kid mode that hides dialing behind a PIN. For other phones, there are apps like Kids Place you can use. There are ways of getting out of these apps though and still provide some risk that your kid might dial 911. The best advice would be to keep your phone out of the reach of your child and perhaps consider buying them an iPod Touch, or other similar device that cannot make calls. Is there a way to program an android phone to call emergency service with a click of a button? Maybe clicking it repeatedly or something? my kid presses the button sometimes when he can’t figure out my lock screen and he’s activated it a couple times. it doesnt pull up a dial pad on my android, instead it puts a little menu bar at the top of the screen with a little red siren icon and a timer. it appears to sent some type of alert signal where im guessing it broadcasts the phone’s location to emergency services. i’ve caught it as high as 45 seconds and turned it off without the police showing up thankfully. -Home button gets pressed by pocket movement and screen activates. All of this just while just walking. After calling elderly Dad repeatedly, I finally figured it out. Now it’s my wife that gets the calls! Wish it would take a long Swipe (between two points) to start an Emergency call, not just a press. Google/Android are you listening? Thanks Mitch. I live in Wisconsin, so your answer should apply to my situation. I have an Android phone with an emergency call button at the bottom of the lock screen. Only one carrier has coverage in an area where my wife frequently travels and it is not my carrier. Will that emergency call button at least assure her that she can reach 911?